Home > Hepatitis C screening. National clinical guideline no. 15. Summary. Department of Health. (2017) Hepatitis C screening. National clinical guideline no. 15. Summary. Dublin: Department of Health. This Summary National Clinical Guideline is relevant to all healthcare professionals, healthcare managers and policy makers working with those at increased risk of hepatitis C virus (HCV) infection. The guideline will also be of value to both statutory and voluntary bodies providing services to those groups at increased risk of HCV infection. 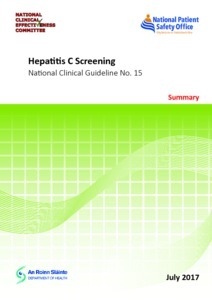 It may also be used by those with HCV or in a risk group for HCV and by members of the public.